DETECTIVE COMICS #998 features some revelations, but two-thirds of the book is taken up by a story that, ultimately, doesn't factor in to the broader narrative much. It's fun, well-drawn and well-written overall, but doesn't feel as vital as previous chapters. Picking up from the last page of the previous issue, Detective Comics #998 provides a twist in the story of the mysterious attacks against Bruce’s past mentors. Batman confronts Hugo Strange, accusing the mad scientist of masterminding the attacks. That lead proves to be a dead end, though, as Batman is summoned to aid Jason Blood. Donning the Hellbat suit, Bruce rushes to rescue another member of his inner circle. One of Tomasi’s strengths as a storyteller is misdirection. He sets up a breadcrumb trail, leading you down a narrative path before flipping the situation on its head. This is a talent he showcases well in Detective Comics #998. The monster attacks fit Strange’s M.O., but he’s not the culprit; the creations are too sophisticated for his abilities. Later in the issue, a situation involving another of Bruce’s close confidants proves to be a trap. None of the twists are completely without setup, though, so they never come off as unearned or like he cheats the reader. It feels like Tomasi may try to condense too much into this one book, though. As a result, Batman’s interactions with both Strange and Blood feel somewhat stilted. 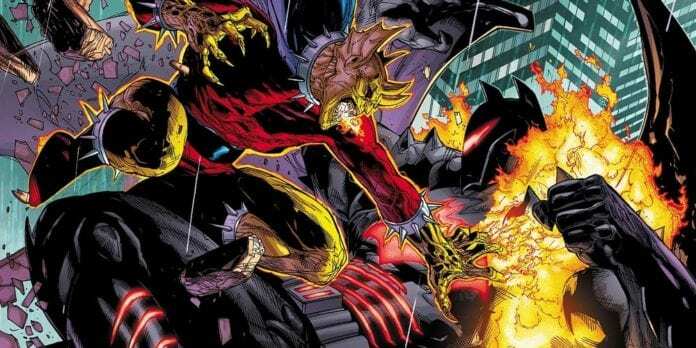 The main issue: while the writing in Detective Comics #998 is high-quality overall, Batman’s attempt to rescue Etrigan is ultimately tangential to the story. Their interaction serves only to redirect Bruce to the payoff at the issue’s end. Thus, while it fits thematically, most of the book reads like a diversion from the broader narrative. He seems to try and inject some profundity into the work with the explanation of the creature attacking Blood. By the book’s end, though, it doesn’t really pay off, leaving that as more confusing than enlightening. Doug Mahnke’s pencils, with assistance on inks courtesy of Jaime Mendoza and Mark Irwin, are impressive as always here. He captures the mood well; the fight to rescue Etrigan is filled with hellfire and power in tightly-packed illustrations that open up to explosive splashes. The slower sequences pull back for wider views, relying on dynamic angles to keep the tension up. Each panel is vibrant, and radiates with energy. Mahnke divides each page differently in Detective Comics #998, though there are arrays of panels that make recurring, regular appearances. This gives the book a nice flow through the chaotic action sequences. Colorist David Baron captures the right tones for Mahnke’s line work. We get fire-lit shadows for Strange’s lab setting, compared to the bright, unnatural tones for the fight against Etrigan’s attacker. Detective Comics #998 is a well-written, engaging story. It’s a shame that the central conflict of the book’s plot distracts from the ongoing narrative, though.